Col Ty Fighter has finished his heated phone call with Dr. Emma Brown, our kid’s astronomy teacher, who has warned him of an impending danger hurtling towards our planet. And with that, the B.A.A. is off to Heston Heights – home of our hero, and this potentially impending disaster. 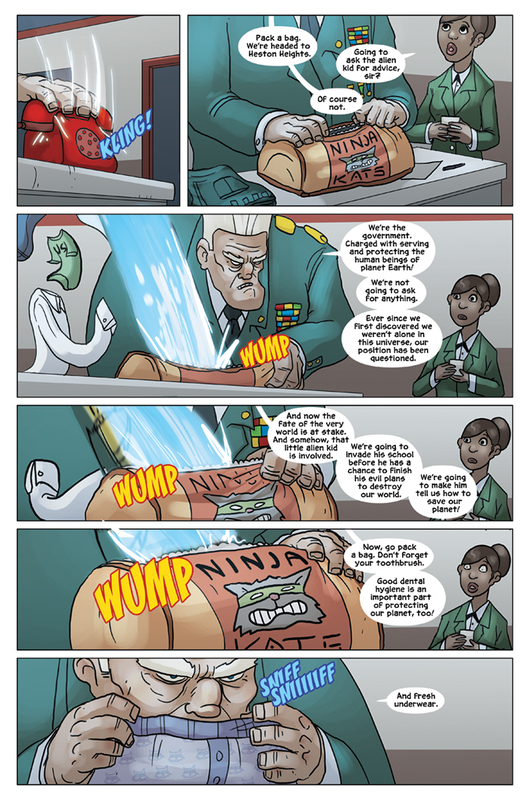 Col Ty Fighter was a lot of fun to write because he’s very direct. And making him direct about silly things – like packing fresh underwear – is, to me, comical. Gabe based his design on an older, pot-bellied Guile from the video game Street Fighter. Then, threw a Ninja Cat on his duffel bag – quite possibly Col Ty’s favorite duffel bag that he’s had for a very, very long time. Do you have a favorite thing that you just couldn’t let go – or still can’t let go?